2001 FLEER ULTRA LIONS TEAM SET (10 Cards)! THESE ARE SUPER BEAUTIFUL CARDS! THEY ARE ONLY ONE SERIES AND ALL CARDS ARE NRMT-MT! THIS SET DOESN'T CONTAIN ANY SHORT PRINTED CARDS! 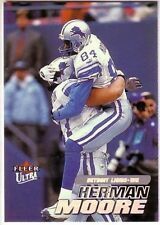 WHEN YOU LOOK AT THESE CARDS IT MAKES YOU FEEL AS THOU YOUR ON THE FIELD PLAYING FOOTBALL WITH THEM! (03)-056 Jim Harbaugh. (05)-115 Junior Seau. Each set contains all base cards (1-200) for the team listed. - We always provide exact players & card numbers to eliminate any doubt. 33-48 ounces = 24.50. (04)-044 Jim Harbaugh. (01)-017 Junior Seau. These contain all base cards for the team listed, do NOT include any of the SP's. Cards average NrMint condition - Included players listed below - We always provide exact players & card numbers to eliminate any doubt. You will receive the EXACT item(s) pictured. 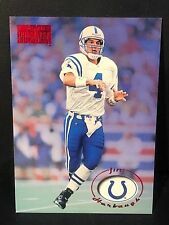 For sale, as pictured, a 1997 Flair Showcase Row 0 Indianapolis Colts Football Card #44 Jim Harbaugh. Card is grade quality. See photos. 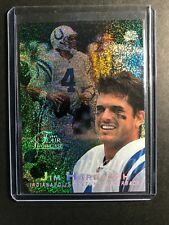 1997 Fleer Ultra Platinum Parallel Jim Harbaugh #P49! A great addition for any player collector, set builder and Colts Fan! Card appears to be near mint. Player: Marshall Faulk, Jim Harbaugh. Set: 1996 SkyBox Premium Thunder and Lightning. Team: Indianapolis Colts. Year: 1996. JIM HARBAUGH. STEALTH /300. 1999 FLEER FOCUS. CARD # 39, # 191/300. NO RESERVE! Rare Jim Harbaugh Fleer Card #220. 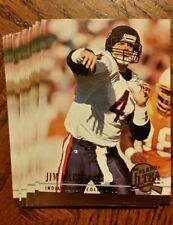 Fleer put these out in 1991 with no production run listed. Very sharp looking card and would make a very nice addition to your collection. Card is in good shape.